Data released this morning shows that the selling price of homes continues to decline, as shown on the graph below. Since it's a "leading indicator of the housing industry's health because rising house prices attract investors and spur industry activity," this only adds fuel to the unfolding story of slowing demand/growth in 2012. S&P in blue. Interest rates in black. Notice an unusual gap growing here? The pattern in Silver Wheaton (SLW that emerges off of last April's peak at 47.60 argues strongly that a complex intermediate-term correction ended at the Oct 4 low of 25.84, a decline of 46%. That was followed by a powerful new up-leg that within the past week has hurdled key resistance at 37.35/40. From a pattern perspective, we can make the case that the current up-leg off of the Dec 29 low at 26.85 represents the "right side" of a big "W" — or Double Bottom formation that was putting intense upward pressure on 37.35/40 on the way to my next optimal target zone of 42.30/60 and then to 44.00/30. At this juncture, only a decline that breaks back beneath the Apr-Feb resistance line at 38.16 will compromise the current upside breakout and thrust towards 42.50. Looking at gold, the SPDR Gold Shares (GLD) is heading for a confrontation with its prior significant rally peak at 175.46 (from Nov 8), which if hurdled and sustained should trigger upside follow-through to 182.75-183 relatively quickly. 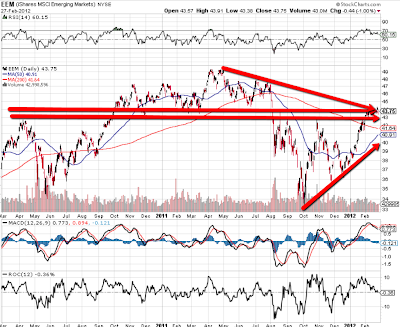 Only a decline that breaks 171.50 will compromise the current upside acceleration phase. Below are a series of 2-Year Daily charts. I'll be comparing the current levels of the Emerging Markets ETF (EEM) with those of the BRIC countries for the purpose of determining relative strength of each. 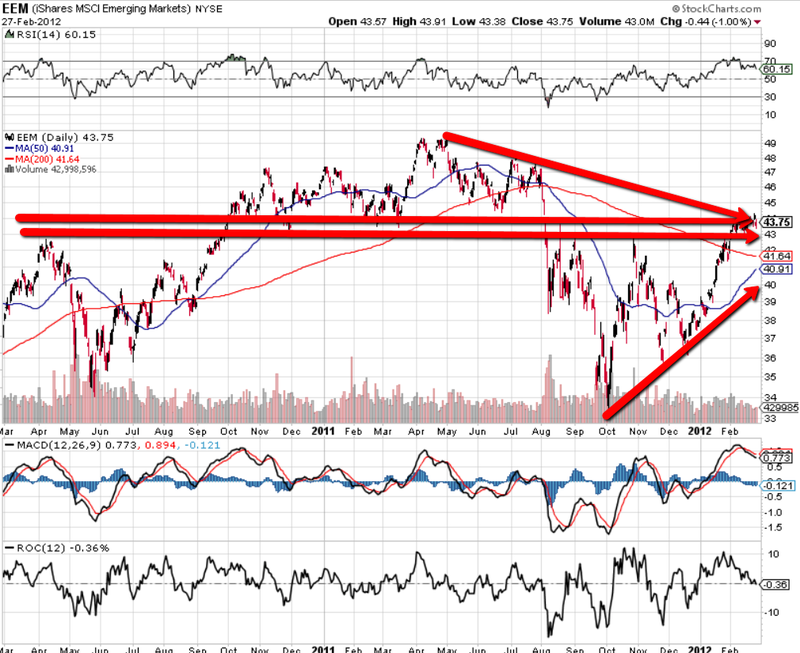 The first chart is of the EEM. Price is currently in a trading range just below major resistance established in the first half of 2011 and just above major support established in the second half. 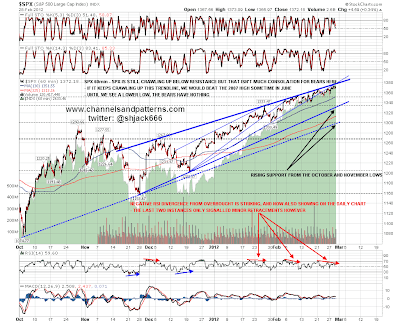 There are negative divergences on the RSI, MACD, and ROC indicators, as well as declining volumes. Price is still subject to the influences of the existing bearish 50/200 sma Death Cross formation, and will be until such time as price breaks and holds convincingly above major resistance, and the moving averages cross to form a bullish Golden Cross pattern.